Gears are very useful to the automata-maker, but they can be tricky to make depending on your knowledge, skills, tools, and patience. Enter pinwheels: gears almost anyone can make! In a previous installment of this column, we looked at a number of methods to make wooden circles. This time around, let’s divide some circles into equal segments to make pinwheel patterns. One method of designing printable pinwheel templates is provided for free by Cabaret Mechanical Theatre as a supplement to their excellent book Cabaret Mechanical Movement. The instructions show you how to create patterns for pinwheels with 36 and 12 pins — a 3:1 gear ratio. The technique requires a computer drawing program such as Adobe Illustrator. The method was first published several years ago, but I’ve tested it in the latest version of the program (Illustrator CS5) and the instructions still work beautifully! If you have access to Illustrator, this is a great method. Note: The ‘Paint Style’ window mentioned in Step 1 may be hard to find these days. You can apply the fill and stroke settings as instructed using either the ‘Control’ bar at the top of the screen, or by opening up the ‘Appearance’ window, under the ‘View’ menu. What if you don’t have Adobe Illustrator? How else can you make a paper template? Fortunately, woodworking mastermind Matthias Wandel has created an amazing online Gear Template Generator. He offers a feature-rich version for purchase, but for our purposes the free version will do. Let’s use the Gear Template Generator to recreate the pinwheel patterns made with the Illustrator technique mentioned above. The Gear Template Generator is designed to generate paper templates for cutting wood gears. When you first arrive at the page, you are presented with a default gear and the settings that were used to produce it. The generator has a number of fields into which you can enter numerical values or enable and disable features. First, check the box for ‘Show pitch diameter’ on the right-hand side of the screen. On a gear, this is the point where the meshing teeth make contact. For pinwheels, this is the circle on which the pins will be placed. Next, check the ‘Show center’ box. This produces a pair of lines showing the exact center of the pinwheel. Finally, check the ‘Dividing plate mode’ box. This changes the gear teeth into line segments representing even divisions of the circle. It is starting to resemble a pinwheel template already! The pins will be located where these line segments intersect with the pitch circle. I also changed the value for ‘Shaft hole dia.’ to 6.25mm to create a hole at the center of the circle that is a bit smaller than 1/4 of an inch. To replicate the large pinwheel template, we’ll need to adjust a few settings. First, we know the large wheel has 36 teeth. Find the input box for ‘Gear 1 teeth’, type in 36, and then hit ‘Enter’ on your keyboard. 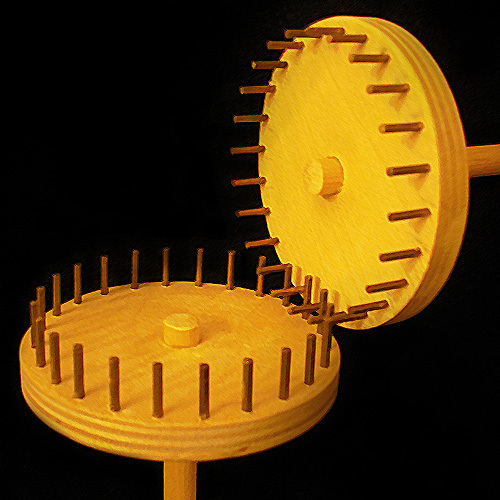 The pinwheel template should now have 36 teeth. Great! But, if you printed it out now, the pinwheel would be very large. Why is that? Notice the first box in the upper left-hand corner labeled ‘Tooth spacing’. This value defines the distance between each tooth and is set to 15 millimeters by default. That’s an appropriate number for robust wooden gear teeth, but a bit big for an automaton pinwheel. The distance between pins for the large pinwheel generated with the Illustrator method was about 5.25mm, so go ahead and type 5.25 into the ‘Tooth spacing’ box and hit ‘Enter’. That’s all you need to do for now. Use the ‘Print gears’ button below the Gear Template Generator to print the template. To replicate the small pinwheel template, we’ll need to modify some values again. We know the smaller wheel has 12 teeth, so type that number into the ‘Gear 1 teeth’ box, and hit ‘Enter’. Done! So why didn’t we change the ‘Tooth spacing’ value? Here’s something very important to remember about pinwheels: regardless of their size, the number of pins per inch must be same for pinwheels to mesh together properly. The ‘Tooth spacing’ field effectively sets the number of pins per inch. Therefore, the value we set for the larger pinwheel is also the value required for the smaller pinwheel. Go ahead and print this template out, making sure to use the big ‘Print gears’ button on the screen. This ensures that the two templates will be drawn to the same scale. If you would prefer a different sized hole in the center of your pinwheel template, change the “Shaft hole dia.’ value accordingly. Entering a value of 0.5mm will give you a small dark point at the center of your circle. The one thing that is not drawn by the Gear Template Generator is the outside diameter of the pinwheel. The pins must sit in some distance from the edge of your wooden circle, so you’ll need to draw a larger outside circle by hand. 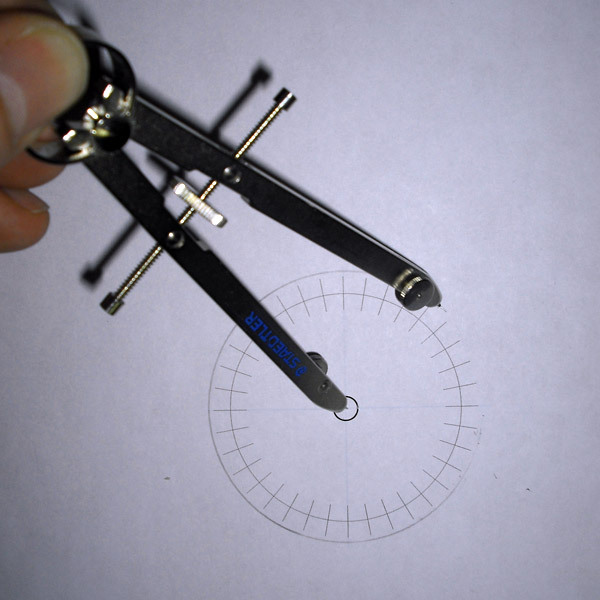 Take a drawing compass and place the point at the intersection of the template’s center lines. Open up the compass so that it extends beyond the drawn pitch circle by about 5mm. This isn’t a critical dimension; you just want to be sure there is enough wood around the pins to hold them securely without splitting the edge. The pin spacing on pinwheels can be wider than the 5.25mm used in these examples. They can up to 9 or 10mm apart and still work. Make a few sets of your own to find out what spacing works best for you. Creating pinwheel templates just scratches the surface of what the Gear Template Generator can do. If you would like to make some wooden gears, this tool is great for creating the patterns. Give it a try! Great tips. Really useful info. Thanks for posting them. Any tips on how to go about creating a coin operated mechanism to put into an automaton? Especially a low voltage version. Don’t wish to shock the audience!!! Any size coin would be fine to use, I’m trying to make a donation box automaton. Bob – Glad you found the article to be useful! There is a bit on this topic in the second to last section of the book “Cabaret Mechanical Movement” (see link in article). Also, if you are comfortable with German, Falk Keuten’s book “Mechanische Spielobjeckte und Automaten” has a section on coin-operated machines. I will keep my eyes open for more. Thanks for this great ” How To” . One question I have is how to calculate the pin or tooth spacing ? My first attempt to build a pin gear set up as a crown gear to change the angle of rotation failed because the pins interfered with each other while trying to rotate. Mike – Glad you found the pinwheel template “How to” article helpful! It is my understanding that the spaces between (standard) gear teeth must be the same. I have assumed this is true for pins as well, but I have not yet been able to verify this with an authoritative source. First, round the ends of the pins if their flat ends are jamming against the side of the pins on the other wheel. Second, play around with the depth at which the pins of the two wheels intersect. Sometimes by moving the wheels closer or farther apart (in one or both axes), they will stop jamming. Finally, change the orientation of the two wheels to each other. Often, by moving the axle of one wheel a little off center from the other axle (so that they are not on exactly the same plane), the pins can be made to mesh smoothly. I have not been able to find much in writing about this particular topic. I would love to hear from others. Thanks for the article. Look forward to trying it. Do you have a good source for the pins you use? Glad you liked the article! Most often, I use solid brass escutcheon pins. I bought a huge box years ago. I can no longer remember where I got them. I can tell you they are 1.25 inches long and number 14 gauge (0.8 inches or 2.032mm). Depending on the size of your pinwheel, your needs may differ. This is a fairly robust pin, and so not as easy to find as the smaller sizes. This is not where I bought mine, but this site has the size mentioned: http://www.jamestowndistributors.com/userportal/show_product.do?pid=1943. Others use brass brazing rod, which comes in 1/8 inch and 3/32 inch diameters. Just be sure to get the bare brass rod; you don’t need the flux. In the U.S., some hardware and hobby shops sell brass rod also — often by a company called K & S Engineering. Look for a display like this one: http://www.ksmetals.com/retail.html. Is there any good reason not to use steel pins? I can get wire nails much more easily than brass pins or even rods. I know rust is an issue with steel and not with brass, but if it is moist enough to rust, then all my wood will probably be warped out of whack too! I am using pinwheels because 90 degree wood gears seem impossible to cut by hand. Love your blog and these posts too! I’ve never done it, but steel pins should work just fine! Thanks for the kind words.